Crowns or caps as they are sometimes called are the best way of restoring broken teeth, or unsightly teeth. 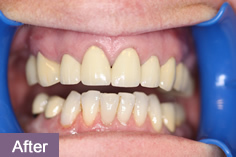 When properly designed and fitted they can restore the appearance of teeth and modern all porcelain crowns are almost impossible to tell from natural teeth. They can be put on almost any teeth and if properly looked after will last for many years. Crowns can also be used to straighten crowded and crooked teeth at the front of the mouth. (see our smile gallery) Before we can be certain this is the best treatment for your teeth we prepare models of your teeth and make “trial” crowns on these. 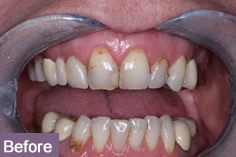 This way we can show you how we can change your teeth, and what the end result will be, so we can both be sure that we can deliver to you the improvement you desire. Sometimes if a tooth has no nerve in it, a post crown is the treatment of choice. The main difference here is that a post is placed in the root of the tooth before a crown is provided. Posts have always traditionally been made from gold alloy, they were very successful but if a modern all porcelain crown is used then some darkness can be visible through the crown. Post technology has now moved on and they can now be made of “fibreglass” which avoids the dark of the inside showing through the crown. The most common crown used to be a porcelain fused to metal crown. In this type of crown the inside is made from a metal alloy and a layer of porcelain is used to cover the surface. These crowns work very well; they are very strong and can last many years. The biggest disadvantage of crowns like these is the metal core. This stops them looking natural and is the cause of the grey edge that is often seen on this type of crown. Natural teeth are translucent and allow light to pass through them. The latest all porcelain crowns are much more lifelike, look more natural, contain no metal and mimic the natural translucency of your tooth. A wide range of all porcelain crowns are now available. The specific type chosen depends on the area of your mouth which needs the crown. Back teeth need stronger crowns than front teeth. The type which most suits your teeth can only be decided after an examination. One of the latest state of the art crowns is a Lava crown from 3M. These are very hard as they have a milled zirconia core with Lava porcelain built on the core for shape. The main advantage of these is that unlike previous milled core crowns, with a Lava crown the core is made from shade matched Zirconia as well as the rest of the crown. The preparation for a crown is similar for all the different types, after a discussion with you about the type of crown we are going to make, the tooth is very carefully shaped at your first appointment. 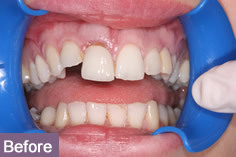 An impression is taken and a custom made temporary crown is made to fit your tooth. The colour and any characteristics of your new crown are also decided at this appointment. We often ask you to bring photographs of your teeth with you to this appointment so we can ensure your new crown will match your teeth perfectly. At the next appointment we try your new crowns in and check they look good and fit well. 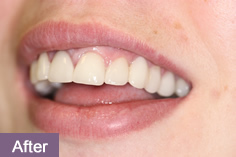 If we think they look as good as they should we bond them permanently onto your teeth. We always check with you if you play any contact sports and recommend a custom mouth-guard to protect your crowns if you do. Can crowns straighten my front teeth? The easy answer to this in most cases is Yes. It does depend on how crooked the teeth are and if there is enough space to fit straight teeth into. We will take you through the whole design process of crowns and give you images of the typical appearance that you can expect if you decide that crowns are the treatment that you want. Some of the images in our gallery show the difference that well designed crowns can make. Which teeth can be crowned? Almost any teeth can have crown put on them, and with the modern posts now available we can crown teeth which are broken almost to gum level. Whether a crown is the right treatment for your tooth will be discussed with you at the treatment planning visit. Prices vary and depend on the type of crown and material chosen. A typical crown fused to a metal alloy will cost £350-400, Superior all porcelain crowns cost more £400-£500 and provide a far more natural appearance. If extra items e.g. posts are required these are charged in addition to the above prices. A typical post will cost £40-£50.